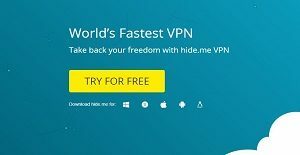 Hide.me is a fast and reliable VPN service for Windows (Desktop and Phone), Mac, Linux, Android and iOS and is available as a premium and free version. The free version offers only three locations, best-effort bandwidth, 2 GB data transfer, limited protocol support and a single connection. On the other hand, the premium version supports more than 30 locations, offers unlimited data transfer and bandwidth and allows five connections simultaneously. The premium version also comes with full protocol support and port forwarding (not available in the monthly package). Both free and paid versions work with all supported devices, but download limit and available bandwidth are the main differentiators between them. The VPN encrypts the internet connection and enables users to browse anonymously and unblock sites and services with geographical restrictions. Hide.me has an excellent reputation of providing anonymity, security and transparency to users. The log-free certified VPN ensures that no personally identify able information is stored on the servers, which even applies to the free version. The VPN fully supports all the major VPN protocols, including PPTP, IKEv1 and v2, L2TP/IPsec, SOCKS and most importantly OpenVPN. Based in Malaysia, Hide.me is not required by law to log the internet data so the company has nothing to share with the authorities when they ask for user activity data. Hiding an IP is fairly simple and can be done in three easy steps i.e. signing in, selecting the server location and clicking the connect button. What differentiates Hide.me from other free VPNs is that no activity logging is carried out even in the free version. This can be a big advantage for users who rarely have to use VPNs and limited bandwidth and data volume does not bother them. The free version also offers comparatively better speeds than other VPNs, which enhances the user experience. Unlike most other free VPN offerings, Hide.me does not monetize by serving ads and selling data to third parties. Even 24/4 support is also available for free users, while the services are provided to all users from the same servers, whether paid or free. If you are considering Hide.me it might also be sensible to examine other subcategories of Best VPN Services listed in our database of B2B software reviews. Every organization has different wants and needs a system that can be customized for their size, type of workers and clients, and the specific industry they are in. For these reasons, no software can provide perfect tools out-of-the-box. When you search a software app, first be sure what you want it for. Read some Hide.me reviews and ask yourself do you desire basic tools or do you want complex tools? Are there any industry-specific features that you are seeking? Find the answers to these queries to aid your search. There are lots of factors that you need to mull over and these include your finances, specific business requirements, your company size, integration requirements etc. Take your time, check out a few free trials, and finally zero in on the platform that presents all that you want to improve your organization efficiency and productivity. We realize that when you make a decision to buy VPN Services it’s important not only to see how experts evaluate it in their reviews, but also to find out if the real people and companies that buy it are actually satisfied with the product. That’s why we’ve created our behavior-based Customer Satisfaction Algorithm™ that gathers customer reviews, comments and Hide.me reviews across a wide range of social media sites. The data is then presented in an easy to digest form showing how many people had positive and negative experience with Hide.me. With that information at hand you should be equipped to make an informed buying decision that you won’t regret. What are Hide.me pricing details? What integrations are available for Hide.me? Pros: The VPN has one of the widest range of protocols. This is important to me since I once had my previous VPN was blocked. If only I got to connect to another protocol I’d likely had bypassed that issue. So I’m glad Hide.me gives me IKEv2, L2TP, PPTP, OpenVPN, Softether, SOCKS, SSTP and IPSec choices. That’s a lot of flexibility. Pros: I didn’t get charged with hidden fees or was surprised with limitations when I started using it other than what they’ve promised to deliver. They also don’t save logs and provide a regular report on requests by the government on user information. This gives me a sense of control over my internet habits. The connection is also fast and steady given that they have 90 servers across 28 locations including the U.K., U.S., Canada and Japan. Cons: The report on authorities kind of make me nervous at times, but I should not worry since I don’t do anything illegal. I just want privacy in my net browsing. If you need more information about Hide.me or you simply have a question let us know what you need and we’ll forward your request directly to the vendor.